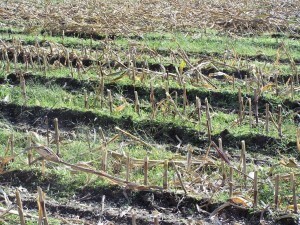 Corn Harvest in Connecticut is a story of 2011 rain and mud. For every day spent out trying to chop corn into much needed corn silage there is three days of rain. In the spring we had so much rain we couldn’t plant all the fields some had standing water in them. Corn likes it hot and sunny. This year we had mostly a cool rainy summer. 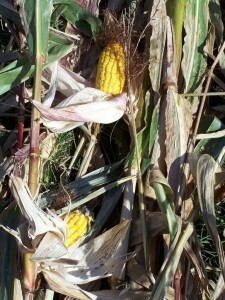 The corn is shorter and the ears are smaller. Fall comes and it is time to begin harvest but the rains just keep coming. Some days it takes a tractor or bulldozer to pull the truck to catch the corn, and a duo of vehicles to chop as well. Then repairs to the rutted fields have to be made when they dry. 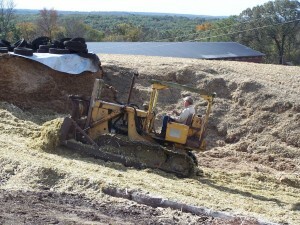 When good weather comes the crew is working steady to get that corn home to the silage stack. Everyone will be happy when the stack is full and covered and we know we have enough feed for our dairy cows for the next year. The tarp covers the old corn we are feeding out still. The new corn is pushed and packed by the bulldozer. The tight packing into the cement lined pit completed, the plastic cover is laid over it and weighted by tires to protect from wind damage. Then the stack of freshly chopped corn ferments. This is the basis of our dairy cows diet. 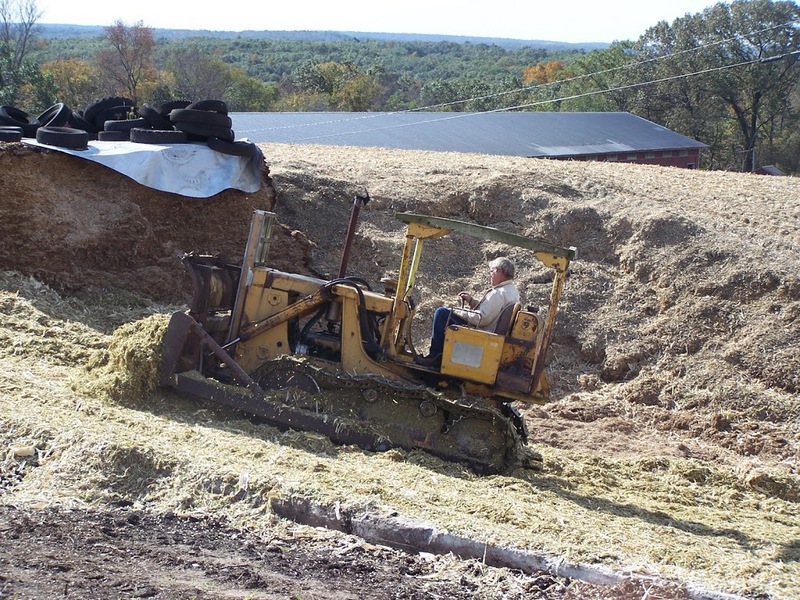 A milk producing cow will eat approximately 40 pounds of corn silage a day. So it is important we get all our corn home and undercover. The frost begins to sap its nutrients so time is of the essence. Our family came to this farm in 1772. The first 100 years here they were subsistence farmers. In 1871 they incorporated the dairy business. www.mountaindairy.com Since then the rhythm of the farm has stayed in tune with the seasons. 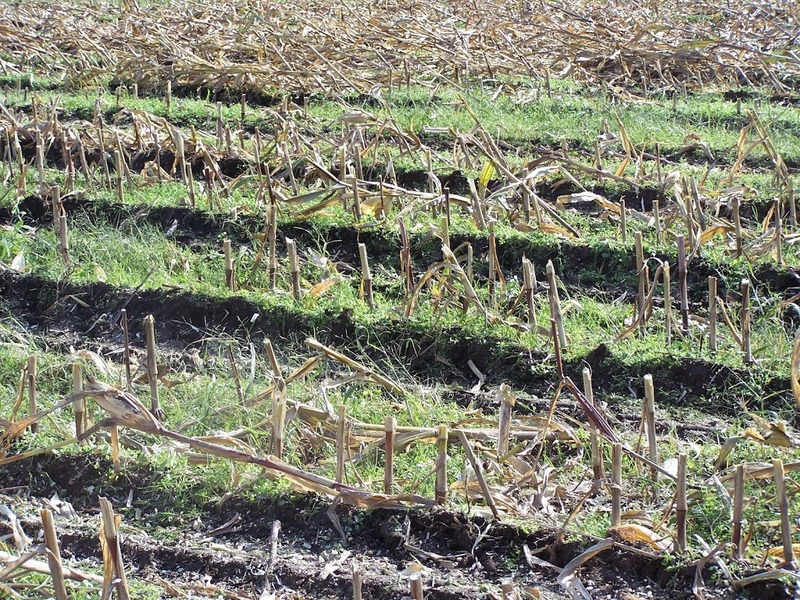 The crops coming and going on the land are the basis for maintaining the dairy cows. The days of horse drawn milk delivery are gone and the glass bottles are only a Christmas Season novelty.The work of milking has gone from hand to machine, what is consistent is the Stearns family being stewards to the land and animals. This is our family story, of working the land and the land nurturing the generations.